Vegan pumpkin cheesecake bars (small-batch) that are entirely no-bake and made with cashews and coconut. 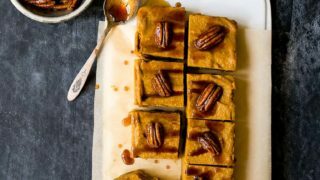 Why vegan pumpkin cheesecake bars? I mean, I don’t really know. My kid just discovered cashews the other day and she is freaking obsessed. She was asking for a snack, and so I introduced her to trail mix. We went through the pantry to find things to toss in a bowl. (If you didn’t know, a 2-year old’s favorite thing to do is stir things in a bowl). We found the biggest bowl in the kitchen, and tossed in freeze-dried blueberries, pretzels, raisins, coconut flakes, and chocolate chips (yes, really). Since I’m always thinking about protein for my little vegetarian, I went through my freezer to find a nut that might work for her. I found some raw cashews, and toasted them in a dry skillet with some pink salt. I crossed my fingers as she took her first bite. She loved them! I’m so elated that she likes nuts in their whole form! (I mean, girlfriend can take down some peanut and almond butter, but I was hoping to expand her nut horizons). Couple this with a nagging complaint for pumpkin pie from Camille. Last Thanksgiving, I made a pumpkin pie (as I’m sure you did, too, but was yours a orange-spiced pumpkin pie with coconut?). I also bought a can of squirt whipped cream, which I almost never do, but when you’re making an entire Thanksgiving for Two from scratch, you take some help, right? After a bit of wine (or maybe it was the turkey), my judgement slipped and we thought it would be funny to teach Camille that squirting canned whipped cream directly into your mouth is one of life’s simple pleasures. She giggled wildly. Oh gosh, did she ever giggle. And begged for more more more. It’s been months since November, and would you believe that she still asks for pumpkin pie on occasion? I’m 99% convinced it’s the whipped cream that she’s really asking for. I haven’t bought a can of whipped cream since then, but I did finally cave and buy her some pumpkin. I mean, it’s after August 1st, right? So, the vegan pumpkin cheesecake bars (no bake) recipe was born. These cheesecake bars are entirely no-bake, and since pumpkin is a vegetable, I want you to enjoy them for breakfast. The crust is the only thing that might trip you up. I wanted to keep these almost raw (and worthy of a healthy breakfast), so I used dates and pecans, pulsed in the food processor with a touch of warm water. But, like, that doesn’t really make an authentic cheesecake crust. So, don’t expect that. Expect a cool, creamy and rich pumpkin cheesecake that doesn’t require a trip to the oven. Expect to be okay with the fact that it’s only August and you’re already enjoying pumpkin. The maple-syrup doused pecans on top are entirely optional. The recipe comes from my melting sweet potatoes (which if you haven’t made those yet, get yourself a couple pounds of sweet potatoes and prepare to give yourself fully to the love that exists within a yam. My father-in-law detests sweet potatoes, but gave these a shot a few years ago and has been eating them ever since. They’re magical). So, let’s wrap up: almost raw vegan pumpkin cheesecake bars. With a maple pecan sauce on top. For you, your vegan friend, your kid who loves cashews, or anyone that scoffs at pumpkin before the first day of Fall. The recipe makes just 8 tiny bites of cheesecake, baked in a bread loaf pan. Small batch cheesecake is life. 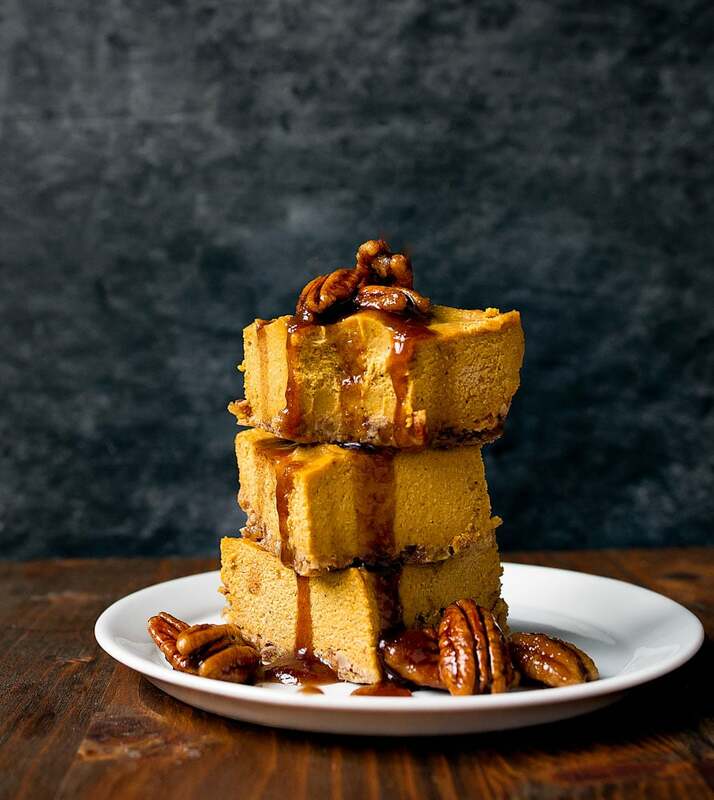 Vegan pumpkin cheesecake bars with maple pecan sauce. First, line a 9x5" loaf pan with parchment paper. Leave enough overhang on the long edge to form handles to help you lift it out. Add the cashews to a small, and pour 1 1/2 cups of boiling water on top. Let them soak for a few hours (or overnight). Drain well. First, make the crust: in a high-speed blender (Vitamix or equivalent), add the warm water, pecans and dates. Pulse until chunky, using extra water as needed, but try to keep it chunky. Press the mixture into the bottom of the loaf pan. Set aside. No need to wipe out the blender before adding the drained cashews, coconut cream, coconut oil, maple syrup, canned pumpkin and pumpkin pie spice. Puree as long as necessary to make a smooth, creamy mixture. It should not have any grittiness to it--keep blending, if it does. Scrape the mixture on top of the crust, spread it evenly, and refrigerate for at least 6 hours. It should be firm to the touch. To make the maple-pecan sauce: toast the pecans in a small saucepan over medium-high heat until fragrant (about 2-minutes). Add the maple syrup and bring to a boil. Boil for 1 minute. Let cool completely before serving with pumpkin pie bars. I am a silent reader. But cant stop from admiring your work in this particular post. VEGAN PUMPKIN CHEESECAKE BARS looks extremely delicious and exotic. Crunchiness of the well chopped cashew and creaminess of the pumpkin puree is absolutely adding up in flavors. This will give a classy taste when we served in front of our guest. On my cook list. Thank You! I am totally making this! I love anything pumpkin, and I eat it all year, not just in the fall! Mostly because it takes so long for fall temperatures to arrive here in STL! Yay for pumpkin recipes! I’m a pumpkin diehard (is that a thing?!) and these look so good I want to make them ASAP! Her recipe for POMEGRANATE CHOCOLATE BARS VEGANAS are perfect to close a dinner or lunch with a golden key, this dessert is divine, wonderful I can not even see that my mouth is full of water and gives a crazy urge to eat. “My kid just discovered cashews the other day and she is freaking obsessed.” Oh is your kid me? oh wow. It is never too soon for pumpkin pie inspired recipes. Cashews are miracle workers – love using them! I agree with Aimee. Last week I made a pumpkin and beef chili and the next day I made pumpkin hummus. I think I should make these with the can of pumpkin I have left. nice technique for making creamed cashews! Wonderful, thank you for this recipe, like the no bake and that they are bars, which to me at least, seem easier to serve than pie, so thank you! Just wondering if there’s a substitute for the coconut oil? Hi Ruth, I’m afraid not. Coconut oil is a unique oil in that it’s solid at room temperature and melted slightly above it. It provides a fudginess to batters, too. Is it that you can’t find it or do you have a coconut allergy? I have the same question- I’m allergic to coconut. Hmmm…can you use regular oil? It’s just that coconut oil has the unique property of solid at a cold temperate, lending a creamy fudge-iness to the cheesecake. Sorry! Maybe a mild-tasting olive oil? Not as firm as coconut, but it will harden in the fridge. Super yummy and very easy to make! It’s a keeper!! Thank you!! 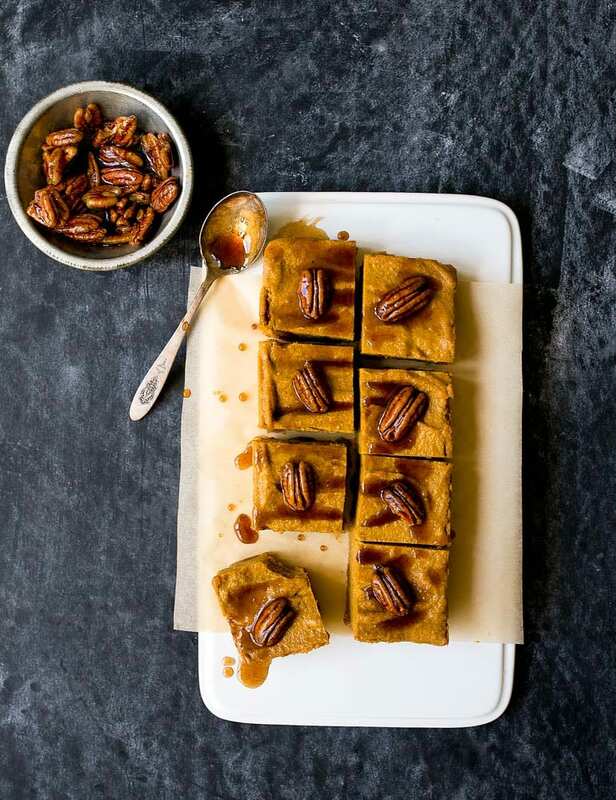 I followed a link from SELF to this awesome recipe for Vegan Pumpkin Cheesecake Bars which I HAVE to try tomorrow and also downloaded 3 other irresistible recipes so I am in the kitchen for the next couple of days and then will have to double my running to work these off before Thanksgiving! Yum!